In an acclaimed film portrayal, Olivia Hussey illuminates the life story of Mother Teresa of Calcutta, the selfless missionary who brought hope, love and salvation to the poorest of the poor. 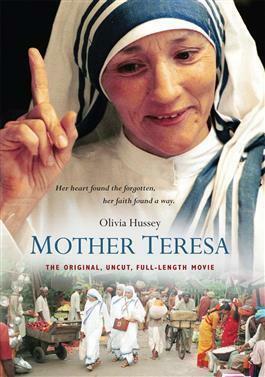 The movie examines the fundamental moments of Mother Teresa's life from her childhood in Albania in the 1920s to her first calling as a nun, the decision to leave her order and live with the poorest of the poor, the vicissitudes of founding the Congregation of the Missionaries of Charity, and her great work of service in Calcutta and the rest of the world. A shrewd diplomat and an indomitable force, Mother Teresa was unwilling to accept what others deemed impossible, fearlessly fighting for the unloved and the forgotten. She was regarded as one of the most significant personalities of the 20th Century, although she never owned more than a white and blue sari. She influenced the decisions of the most powerful men on Earth, although she always stayed close to the poorest people of the world. The film follows her through the slums of Calcutta as she mingled closely with her people, dispensing help, joy and smiles to everyone, with her loving embraces, and also shows her stubbornness with the people who wanted to block her way. Her faith and good works transcended hardships and ultimately earned her international acclaim, including the Nobel Peace prize. The many small miracles, great charity and humble triumphs of Mother Teresa will inspire you in this poignant tale of a modern-day saint. "In the film, Mother Teresa, renowned actress Olivia Hussey renders an authentic and compelling portrayal of Mother Teresa, the determined and compassionate saint of the gutters. Thoroughly moving and profoundly inspiring, Mother Teresa will stir your heart. I highly recommend this film." -Donna-Marie Cooper O'Boyle, EWTN TV Host and author of numerous books including: Mother Teresa and Me: Ten Years of Friendshipand Bringing Lent Home with Mother Teresa. The complete, unedited, original full-length 177 minute film never before seen on DVD. Includes a 16 page Collector's Companion Booklet. This DVD contains the following languages: English with English or Spanish subtitles.